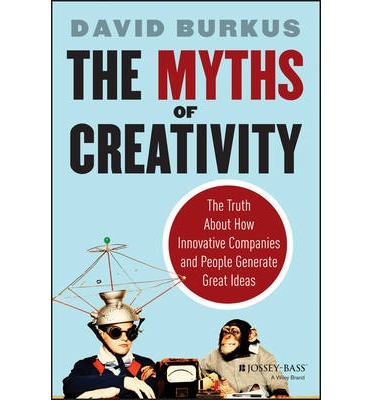 Creativity Myths Busted : Good Read..
What do famous directors, inventors, techie billionaires, writers, entrepreneurs, etc. have exclusively in their coterie that we don’t? Nothing! Shocked to hear that? Well, that’s not just a hollow motivational uplifter, but a doctoral thesis carried out by David Burkus, an assistant professor of management at Oral Roberts University and author of the book The Myths Of Creativity: The Truth About How Innovative Companies And People Generate Ideas. This is a truly excellent read for all budding entrepreneurs and those who think in breaking paths.. The Eureka Myth – We have come to believe that all great ideas come in a flash of insight. With Isaac Newton as the chief proponent of this theory, who discovered gravity with a fallen apple from a tree, we couldn’t help but mystify all inventions as coming from a Eureka or Aha moment. But as Mr. Burkus has found out through his research, innovative insights come from hard work and dedication to a problem. The answers incubate in our subconscious and although, sometimes, we connect two distantly connected dots suddenly, it is later realized that they were the result of a long, internal process. The Rare Breed Myth – Creativity is said to be an elusive characteristic belonging to only a blessed few. Only this rare breed has the right to be labeled as “The Creatives”; while the rest of us can be assumed to be The Non Creative Types. But evidence suggests something quite the opposite: that there is no naturally creative breed per se. Thus, it can be safely concluded that creativity is not born but made; and that anyone can be creative. Ok now, don’t just Hurray yet! The Originality Myth – Creative people or companies are assumed to be 100% original with their ideas. But history suggests that all great ideas are the work of more than one person. Henry Ford developed the assembly line production of automobiles after seeing the production facilities of meat packing plants. Often other people are working on the same idea as its foundation is laid on a piece of inspiration more than one person can piece together. For example: the day Alexander Graham Bell filed for a patent for the telephone, another woman Elisha Gray filed a patent for a similar device. So there is no such thing as 100% originality. But we still advise you not to go the Pritam and Anu Malik way! The Expert Myth – It has been believed for the longest time that problems can be solved through experience. Wrong. If that would have been the case, all 60 plus scientists would have won the Nobel Prize. In reality, most scientists who have won the Nobel Prize in physics were in their twenties. To tackle a problem, it is better to come with an outsider’s perspective. So bosses must not turn a deaf ear at suggestions that new or young employees offer. And as a young employee yourself, you must not take age to be a constricting factor in presenting the next big thing. The Lone Creator Myth – We often assume that great things come from a lone individual but that’s not entirely true. Creativity is a team effort. Even Edison worked with others to produce marvelous inventions. So you should partner with the right people to give shape to bigger, better ideas. And even offices should choose the right team of people for grand, creative projects to come to fruition. The Brainstorming Myth – Companies often have this naïve idea that you put people in a room, set the ball rolling, and wham bam! People will start brainstorming and amazing ideas will be unearthed. This approach may be good once or twice, but it is not a very consistent approach to achieve creative breakthroughs. The secret to correct problem solving lies in abundant research on the part of the team. Brainstorming can just help shape an originally solid idea. The Cohesive Myth – If creativity requires teams, then the teams must work happily ever after. No, in fact, cohesiveness is actually known to hinder innovative thinking, as people hold back on challenging ideas for the fear of disrupting the group’s personal bonding. “Creativity loves conflict as long as it’s professional, not personal”, Burkes says. The Mousetrap Myth – In the nineteenth century, Ralph Waldo Emerson was quoted as saying, “Build a better mousetrap and the world will beat a path to your door”. It simply meant that if a man can make better technology, or corn, or boards, or chairs than anybody else, he will find a broad road built to his door, however deep he may be in the woods. But it’s not that simple in today’s times. One has to constantly keep reinventing themselves to survive in this ruthlessly competitive world. Even Apple has to innovate on its product portfolio yearly, after having claimed the No.1 position in the tech world for long. Although we must concede that the world did kinda’ build a road to Steve Jobs’ house (wait, translate it to— made a beeline to Apple showrooms) after they were enough enamored with the simple, beautiful and powerful machines that the man built.